LED 8-foot lighting retrofit kit with four bulbs is a set of components that allow you to convert two lamp 8-foot fixtures to a four lamp LED in a fluorescent to LED configuration. It saves energy by directly converting 8 foot T12 slimline instant start lamps to leds. Here's what makes it so easy to use, it comes prewired, so there's no problematic rewiring to change to LED lamps. This retrofit kit requires that you use the existing ballast cover from the previous fixture, so you want to save those and reuse them. The LED tubes are included, and you can choose the color temperature that you would like that best fits your interior space. The color temperature choices are 3500K, 4000K and 5000K. The 3500K is a neutral slightly warm light, the 4000K is like office lighting white, and the 5000K is like noontime daylight. For most industrial or commercial applications people typically choose the 5000K for its whiteness and brightness. So now you can get rid of those eight-foot fluorescent lamps that most people would like to change to something more energy-efficient. These are easy to install, and each one will take just minutes to change once you get going. A fluorescent strip light fixture has been the mainstay of things like warehouse lighting, production facilities and anywhere you want to get a lot of light, but many people want something like LED now which can give them the same amount of light for fewer watts. To install, all you need to do is take off the existing ballast covers, take out the ballast and sockets, so you have the channel left. Then you can take the LED retrofit kit and attach the new ends in sockets wiring it directly to direct power. The LED lighting tubes themselves are LED T8 lamps, so they are the same physical size as the older fluorescent T8. This is a great way to change out your existing a fluorescent fixture to LED, and it’s done at a low cost as well. We mention T8 lamps here, but these can be used with either T8 or T12 existing lighting systems. Most people are changing the eight-foot lamps that have a single pin, but there are situations where people might be changing the high-output version, in either case, it all depends on your personal preference for you strip fixture. As far as energy savings go, you should see a substantial reduction in lighting costs and get great paybacks as a result. Most people when they do a retrofit will have a payback from one to two years without any utility rebate. If you do have utility rebates in your area, you may see that reduced even further making it something easy to implement for your situation. This product is made in the USA with high-quality standards making it something that’s going to last for a very long time. Some people are motivated by the energy savings, but there are maintenance savings involved as well. The light bulbs have a very long life, much more than the old eight-foot lamps and they are easier to change. - 4 LED lamps included. - Prewired strip retrofit kit. 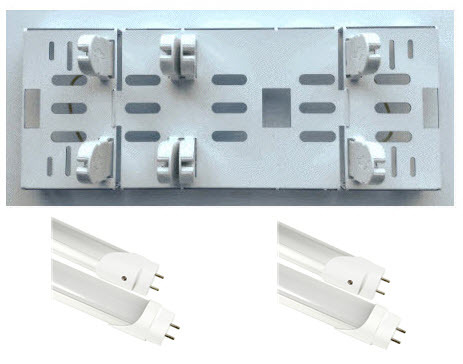 - Brackets with sockets that convert slimline T12 to 4 lamps LED strip. You'll love our energy-saving 8-foot lighting retrofit kits because they’re easy to install and you're going to save a lot of money over time. We want to help you save money and lighting is one of the best ways to do that without any sacrifice. Our lighting retrofit kits are made in the USA, and we are proud to offer those at great prices and plenty of inventory for any size project that you may have going. One of the reasons many people want to do this kind of retrofit is that they want to get rid of eight-foot lamps altogether. They are kind of hard to manipulate when you’re putting them in a light fixture, and they are very vulnerable to breakage. So many people want to get rid of them so they can have four foot light bulbs everywhere. Saving money with this type of lighting. If you’re unsure as to how much you can save by going to a more efficient retrofit kit, we have a free downloadable Excel spreadsheet that will give you all the calculations you will need to make an informed decision regarding energy savings. It’s in the left-hand column of our website, and it will tell you how much you can save in real dollars and what kind of a payback you get. The payback is the time it takes to recoup the investment you make with the new equipment. All you have to do is put in some essential data about your existing lighting system such as watts, kilowatt-hour cost, how many hours a year you run it and of course the investment in the retrofit kits that we carry. You’ll find that many people get anywhere from months to a few years in a payback depending on how much they use them. If you have a 24 hour a day operation, you’re going to get a swift payback. If you use it only during office hours every day, you’ll see that stretch out a bit. Getting rid of 8 foot light bulbs. People see this as an opportunity to upgrade their lighting to make all their lighting more consistent throughout a commercial building or even in a home lighting situation, but they also want to save a lot of money in energy costs. And that’s something you can do with a retrofit kit like these. Most of the time people are choosing the LED retrofit kit as opposed to fluorescent tubes. Even though going from a T8 or T12 eight foot strip light to multiple 4 foot T8 lamps, people are now choosing the LED tubes. One of the reasons why is that they can change the fluorescent fixture and get rid of the instant start ballast altogether. Even though there are LED lamps that will operate on some electronic ballasts, often people are wiring these directly to power and eliminating the ballast forever. We have these retrofit kits with a ballast cover or without made to replace these T12 fluorescent strip fixtures, and the package includes everything, even including tek screws. That’s why it’s one of the easiest ways to retrofit these eight-foot channel light fixtures that you see in almost any situation. If you have warehouse lighting or manufacturing that has these, you can do a retrofit. If you have these in a home garage situation, you can do a retrofit. Most of the time the eight-foot lamps that are being replaced are the single pin variety which is also called a slimline. It typically ran on magnetic ballast and is not considered energy-efficient anymore. Keep in mind that there are also a lot of electric utility rebates for commercial users because they use so much electricity. They offer incentives to get building owners and managers to retrofit to more efficient LED lighting. Sometimes these incentives are reasonably lucrative, and it can reduce your payback significantly, many times getting you payback in less than two years. You can also save because some of this labor is done in-house by maintenance people, but if you don’t know how to rewire or are unsure about working with electricity, you need to call a licensed electrician. That way you can make sure that the job is getting done right and you can figure in the cost of labor as a result of your payback. Sometimes that’s the best way to do it if you have a commercial building and you have many light fixtures possibly doing it off hours, so you don’t have to shut down any part of your production or employee productivity. Another thing to take into consideration when moving to more efficient LED lighting is the color temperature of the retrofit kit. Some people like a very bright white like a 5000K color and you’ll see that used many times in a lot of commercial and industrial buildings. It’s also used a lot in outdoor lighting, and we have many types of screw-in retrofits there as well. For some people who are going to be retrofitting things like recessed lighting in some existing housing for a home, a lot of them prefer a warmer color light such as a 2700K color. It’s very close to the color of incandescent lighting, often what people are replacing with this type of retrofit. Good lighting is the goal. When making this kind of decision to save energy, you also need to keep in mind that one of the goals of this type of upgrade is the quality of the lighting you have. Good lighting can make the difference between greater productivity in an office or manufacturing facility, or just making your home look better. Now you can finally get the energy savings you would like while still getting better lighting. There’s never been a better time to get both of these together in a very efficient lighting system. As we often say, if you save all kinds of money on energy but have a poor lighting job, you haven’t saved anything. That’s especially true if it’s a commercial business or retail store, it can adversely affect sales and productivity. So this is an opportunity to get it done right the first time and make sure you have a great product is going to serve you well for energy efficiency but then also for an excellent lighting effect. Please call or email us if you have any questions regarding anything you see in regards to 8-foot retrofit kits. We’ve seen many successful customers getting a significant reduction in energy and having better lighting as a result. You can ask is any question you like about the components, about what you’re thinking about doing or about the quantity price. Often people buy these in more significant quantities because it’s part of a more significant project and we want to make sure that we give you the best price possible that we can do. If you’re unsure of how to apply this to your situation, you can always email us a picture or two of what you have and what you’re trying to retrofit.